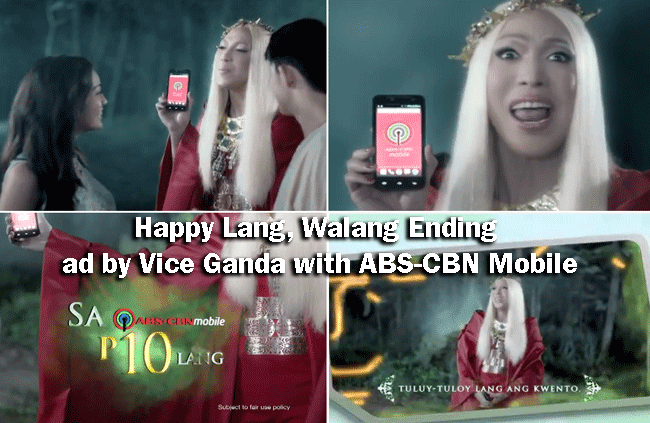 Vice Ganda is the latest endorser of ABS-CBN mobile’s promo “Happy lang, walang ending” and it goes trending online. The said commercial is ABS-CBN Mobile’s laterst promo. Subscribers can have unlimited text to all network for P10. The commercial became more popular because Vice Ganda repeatedly mentioned “Walang Ending” in “It’s Showtime.” This is another success in ABS-CBN mobile’s commercial with actor and tv host Vice Ganda as the endorser. We have known for a fact that Vice has endorsed a lot of products that has something to do with mobile network. The video depicts a man and a woman who is about to meet and kiss each other saying “sa wakas, happy ending” when suddenly Vice Ganda interrupted their kissing scene saying “Happy ending talaga? Hindi ba pwedeng happy lang, walang ending?” showing the latest promotion of ABS-CBN mobile and laughing out loud after. The said promo can last for 1 day. This is very affordable and to the advantage of the mobile phone users. In order to subscribe to the said promo of ABS-CBN mobile, text KTANU10 TO 2135 and a confirmation text will then be sent to inbox to verify subscription. With ABS-CBN mobile, you can access to different services offered in connection to ABS-CBN programs. You will surely get to enjoy using this mobile phone that has several purposes. Texting will never be the same again with the use of ABS-CBN mobile and with “Happy lang, walang ending” promo.